All recyclables can go in one container! 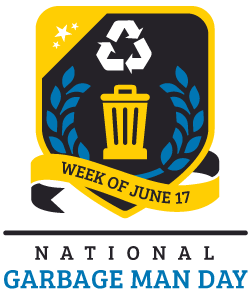 Place paper, cardboard, recyclable steel, aluminum, glass and plastic containers loosely in your recycling cart. Do not place plastic bags or medical sharps in your recycling bin. Interested in seeing a detailed list of what can and cannot be recycled in Leon County? 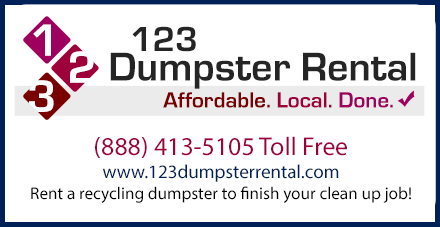 Check out our What Can Be Recycled List to see specific items listed by material. All electronics and household hazardous waste, such as televisions, cell phones, batteries, lightbulbs, cleaning materials, etc., should be taken to our Household Hazardous Waste Facility at 7550 Apalachee Parkway. 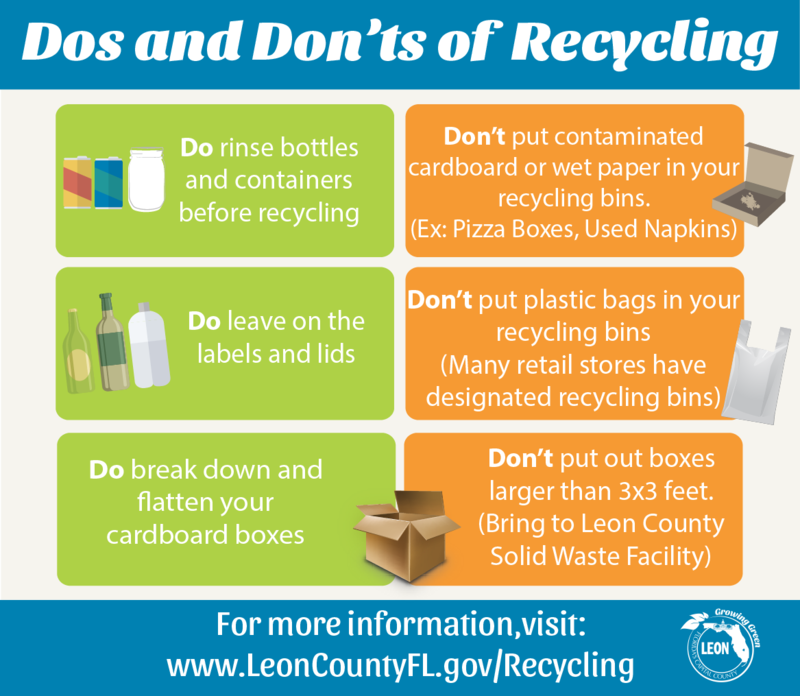 Although these items cannot be recycled in Leon County bins, there are other locations that may accept them for recycling. Plastic Bags: Leon County does not accept plastic bags. A lot of large retailers or grocery stores in Leon County will often accept and recycle plastic bags. Styrofoam: Leon County does not accept Styrofoam. Some grocery stores will accept and recycle clean foam egg cartons and trays. Package shipping companies (UPS, FedEx, PakMail) will often take back packing peanuts or packing foam for re-use. Medical Sharps: Medical Sharps such as needles, syringes and lancets cannot be placed in your Leon County recycling bin. Residents can pick up a free sharps container from certain Leon County Health Department sites. When the container is full, return the closed box and receive a new one at no charge. Note: Do not put medical sharps in bottles or recyclable items and then put them in the recycling bin. These items can be a very dangerous hazard to workers at the recycling center. 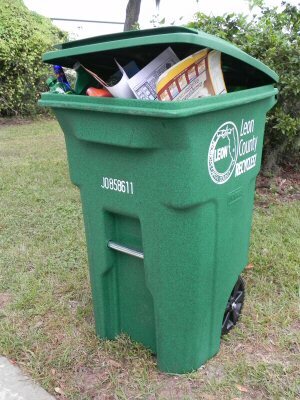 Curbside recycling: In unincorporated Leon County, recycling pick-up is done on the same day as your garbage pick-up (if you live in Tallahassee, contact the City of Tallahassee, 891-4YOU or www.talgov.com, for the city pick-up schedule). If you live outside city limits and would like to subscribe to curbside pick-up, contact WastePro at 606-1899. Leon County Solid Waste Management Facility: Leon County residents can drop off their recycling at our Solid Waste Management Facility (7550 Apalachee Parkway).Open 8:00-5:00 pm, Monday-Saturday. Closed on Sundays. What Can Be Recycled in Tallahassee? Plastic containers, metal cans, glass bottles, paper and cardboard items are all recyclable in Tallahassee. Just remove the lids of any plastic, glass or metal container, rinse out (not required but can help keep bugs and smells away) and place in your Recycling Container. Remember to breakdown any cardboard and gift boxes. 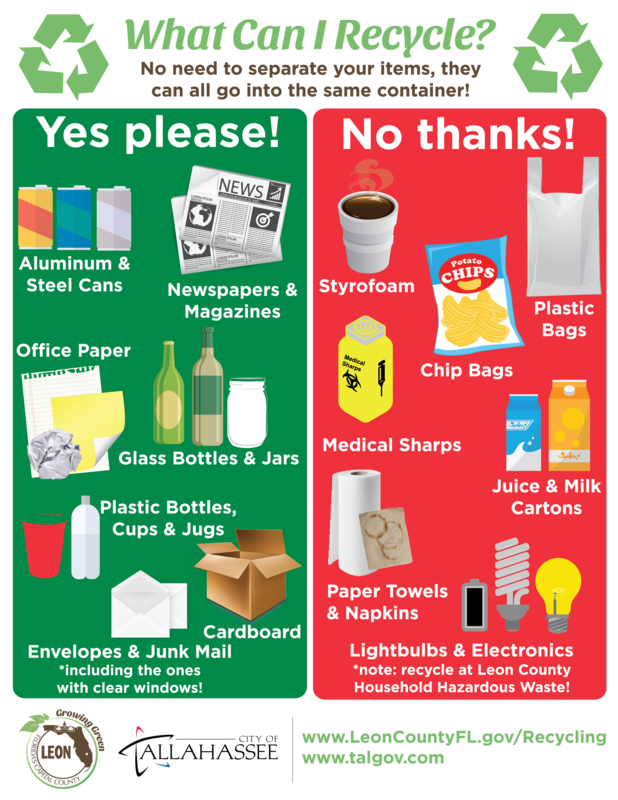 Download the recycling guide poster. There are lots of reasons why someone should make an effort to recycle as much as possible. Here are some good reasons why you should start making recycling a habit. 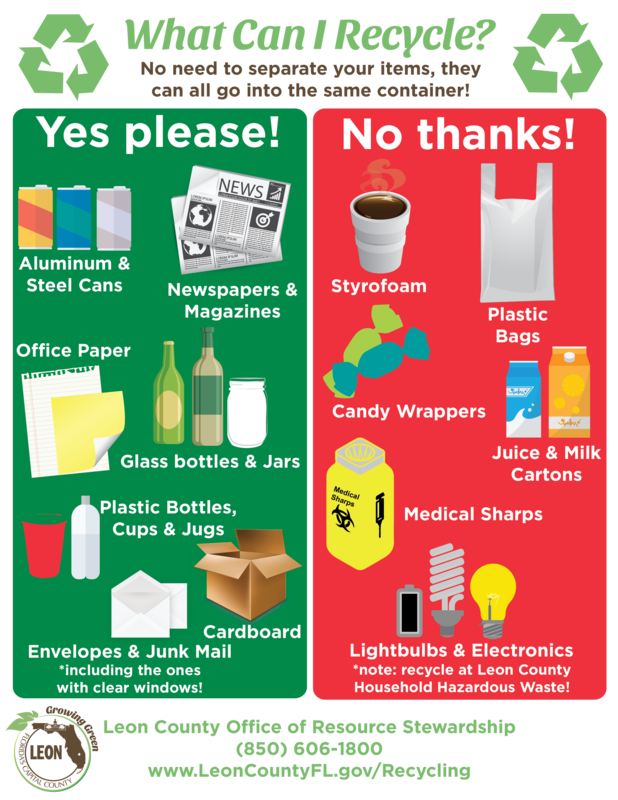 Download the recycling guide poster. It cuts back on global warming. Production of certain materials from scratch can release significant amounts of CO2 into the atmosphere. Aluminum production is a prime example-producing new aluminum creates 95% more CO2 than recycling old aluminum cans. In addition, recycling paper saves trees-for each ton of paper recycled, 17 trees are saved. Each of these trees can extract around 250 pounds of carbon dioxide from the air in a year. It makes us more energy-efficient. The amount of energy to produce something from recycled materials versus raw materials is a significant decrease. For example, it takes twice as much energy to burn plastic as to recycle it; it takes 64% more energy to make paper than to recycle it; and recycling just one pound of steel can save enough energy to run a 60-watt bulb for one day. It keeps our landfills from overflowing. With available landfill space becoming an increasing concern, there’s no time like the present to reduce, reuse, recycle!┬á Studies show that 60% to 75% of garbage in landfills can be recycled. That means that if everybody recycled, we’d have 60% to 75% less garbage in our landfills, and we’d need at least that much less land for garbage disposal. It improves the quality of our groundwater. Rain and other runoff from landfills get into our streams, rivers, lakes, and other waterways, damaging fragile ecosystems. Recycling reduces the trash in landfills, and the more we recycle, the more our water systems can improve. It reduces air pollution. Many factories that produce plastics, metals, and paper products release toxins into the air. Recycle these materials, and there will be less need for companies to manufacture new materials-saving on the amount of pollution released into our air. It creates jobs. Recycling is a growth industry, earning billions of dollars annually. Our need to recycle is only going to grow as populations grow and as technology changes. Recycling creates far more jobs than landfills do-enough jobs to make a big difference in a small town. It conserves our natural resources. Americans disposed of 83 million tons of paper products in 2003. According to the EPA, by recycling nearly half of that, we saved 705 million trees and 290 billion gallons of fresh water. 4% of U.S. annual oil consumption, or roughly 219 million barrels of oil, goes into the manufacturing of plastic. The more plastic we recycle, the less oil we use. When non-recyclable items are mixed with items that are accepted for recycling in Tallahassee, they can contaminate an entire load of recyclables. When it is feasible, these unaccepted items are sorted out at a recycling processor by hand and then taken to the landfill. However, a contaminated load can be rejected by the recycling processor as unusable, and the whole load has to be taken to the landfill. Then, we lose tons of recyclable material due to a small amount of contamination.